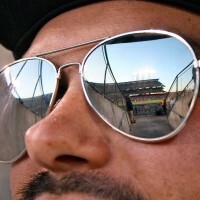 Story by Julian Espinoza and David Rodriguez. Photos by David Rodriguez. As a child, Eugene Riley, now twenty-five, frequently visited San Francisco State University. His mother studied there and he had, owing to several years of playing the violin, even performed at a seminar in the Creative Arts building. But before he could actually attend classes there, he was shuffled around high schools in four different states, was homeless for months, and spent four nights in jail. Last year, Riley got a text from a friend asking for a ride. He had recently gotten a new Honda and his biggest concern that day was an overdue oil change, not handcuffs and flashing lights. After he picked up his friend, the two drove for a while before police pulled the car over, telling Riley he had ran through a red light at the intersection of McAllister and Jones Streets on the edge of the Tenderloin neighborhood of San Francisco. During his search of the car, the police officer found a loaded handgun. Riley and his friend both went to went to jail and Riley was booked on June 5, 2017. He said he faced two felony charges after his arrest, one for carrying a loaded firearm in the car and one for concealment of the firearm. He was nervous when he first got there—the body cavity search caught him off guard and drove home the seriousness of the situation. He called more than twenty people, but only three answered. After pleading to a reduced misdemeanor charge, Riley was released four days later. He would have been sentenced to three to five years in prison if he had not taken the plea deal offered to him. Instead, he got three years probation. If he’s arrested and charged with a crime again, he is liable to face his original sentence as well as the added sentence of the potential new crime. Riley grew up in the Western Addition neighborhood of San Francisco and was mainly raised by his mother. Their relationship was tumultuous. Eventually, she moved Riley around to stay with family in Michigan, Florida, and Mississippi. Before he graduated from high school in 2011—despite being told it would be unlikely—he had attended six schools in four states. After graduating, he received a walk-on scholarship to play football at Kentucky State University. His decision to go to school out of state was partly fueled by his desire to get away. 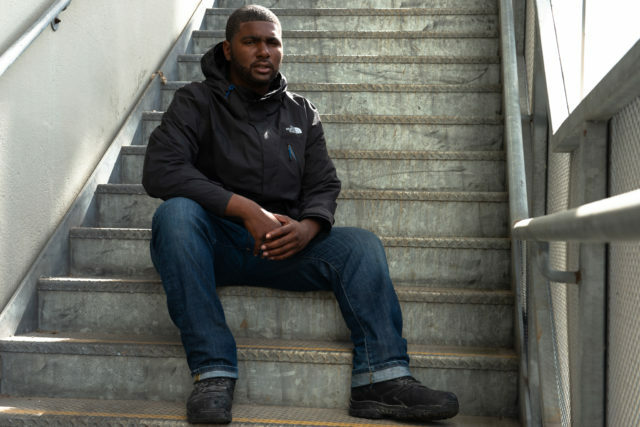 SF State student Eugene Riley, 25, has been a member of project rebound since this past summer. “Words can’t describe what I’ve been experiencing, even when life is hard you must keep the faith, cause you never know when your life just might turn around.” On Thursday, Oct. 04, 2018 Xpress Magazine/David Rodriguez. During his sophomore year, Riley hurt his ankle before season training and lost his scholarship. He remained at the school for two more years through a work-study program studying business with a concentration in accounting. He made it work for a while, but the hardships of his personal life overwhelmed him. His girlfriend was hospitalized after a car accident. A cousin he was particularly close with was sentenced to thirty years to life in prison. Eventually, Riley decided to move back home to San Francisco, where he considers home. He has mixed feelings about the city, mostly because of its significant levels of income inequality and gentrification. In August of last year, Riley moved into an apartment in Fremont, California with his girlfriend. He had been using his car for services like Uber and Instacart to save up money, and in September and October he worked a temporary position at Tesla framing the rear seats and doors for the Model S and Model X vehicles on the assembly line. He was spending about $3500 each month on rent, insurance, and car payments. Neither the relationship nor the apartment lasted. Near the beginning of January he was evicted and moved back up to San Francisco to stay with his mom, who made it clear that his time with her would be temporary. Between February and May he moved around a lot, alternating time between couch-surfing with friends and sleeping in his car. Eventually, his car was repossessed because he could no longer afford to make payments. For the next couple of months he spent much of his time in the Tenderloin neighborhood and would sometimes sleep on Bay Area Rapid Transit (BART) trains. He decided that he wanted to go back to school and find stable living arrangements for himself. His probation program referred him to Young Community Developers, a non-profit in San Francisco, and he was given job-training and housing. “Through my case managers there, I was introduced to Doris and Jason at Project Rebound and was enrolled into school,” Riley said. Project Rebound, which celebrated its fiftieth anniversary last year, gives formerly incarcerated individuals the chance to attend college. The program was started at SF State by John Irwin, who himself was incarcerated before becoming a sociology professor at the university. The program has spread to seven other campuses in the California State University system and is in the process of expanding further. Riley says the process of starting at SF State happened quickly. He met members of Project Rebound on a Thursday and was registering for classes as an Africana Studies major by the following Monday. He is attending just one class this semester—a course on black family studies. He hopes to be a full-time student entering his junior year in fall of 2019. He is also thinking about going into a trade for financial stability and plans to eventually return to school to finish his accounting degree. Through his probation program, he got a job with the city’s Department of Public Works, usually involving street cleaning and picking up trash. Because he often heads to campus straight from work, he can frequently be found on campus wearing his fluorescent safety-vest. Eugene Riley, 25. (David Rodriguez/Xpress). Before he started class at SF State, Riley visited the campus frequently as a kid. He would accompany his mom, who was a student at the university at the time, whenever he got into trouble at school. He also played violin in a string quartet—he played the instrument for eight years as a kid but does not play today (he called it one of the “artifacts” left at his mother’s house)—which once gave a performance in a seminar at the Creative Arts building on campus. During his time at Kentucky State, Riley joined the SF State chapter of Omega Psi Phi, a fraternity founded in 1911 at the historically black college Howard University. He continued his involvement with the fraternity when he returned to the Bay Area and attended fraternity events on several nearby university campuses, including SF State’s. He said he appreciates the mentorship his brothers have provided, even if he sometimes struggled to live up to the message the organization professes. 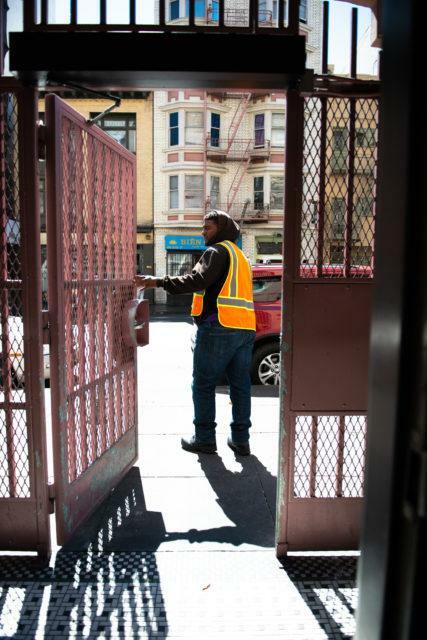 As part of a photojournalism workshop sponsored by local nonprofit Catchlight, Riley and other members of Project Rebound were given cameras to take photos in the Tenderloin. The neighborhood has so often been associated with drugs and homelessness. Riley said he associates the neighborhood with good music—reggaeton being a favorite of his—and the endless options of food choices. Last month he had a photoshoot with Vice Magazine, who took interest in his work. Photographers Brian Frank and Justin Maxon, who were part of the Catchlight workshop, had lobbied the publication after recognizing Riley’s talent. 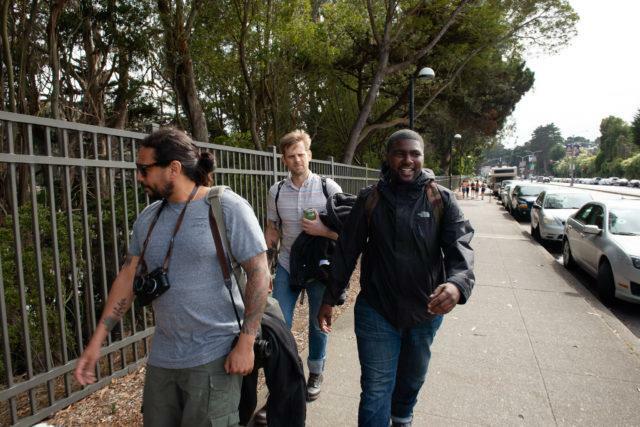 Brian L. Frank, left, Justin Maxon, middle, and Eugene Riley, are all walking down to Lake Merced to take photographs of Eugene for the Vice Magazine piece that Eugene will be featured on. “I’m forever grateful to Brian and Justin for taking a chance on me,” said Eugene. Photo taken on Thursday, Oct. 04, 2018 by David Rodriguez/Xpress. “They feel that I have an eye for photography and they liked the story that I told,” Riley said. For now, photography remains just a hobby for Riley, as he balances work, his time at school, and his pursuit of a more permanent housing solution. 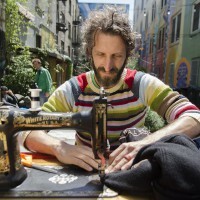 Currently, he lives in a single-room occupancy unit in a halfway house in the Hayes Valley neighborhood. He must leave the house by next August, and so he has just turned in his first housing application. He hopes to be called in for housing before that, but also would prefer to avoid having to move during midterms or final exams. Riley says that after he was released from jail he was considered a low-risk offender and does not formally have a probation officer assigned to him. With his scheduled hearing in January, the result of which he hopes will remove his probation status. He feels optimistic, but believes that his status now makes him a target for potential police scrutiny. He believes that some police officers look for any opportunity to take someone back to jail. In their eyes, he says, once a criminal, always a criminal. He felt the same kind of judgement from some of his friends and family after he was released from jail. Many of them, seeing his determination in getting his life back together, eventually changed their minds. “My story is not all just negative, even though the birth of this story started from somewhere negative,” he said. Today, his principle concerns involve attending class, taking good notes, and doing well on quizzes. He says he looks forward to getting some of his life back and to being a working college student again.